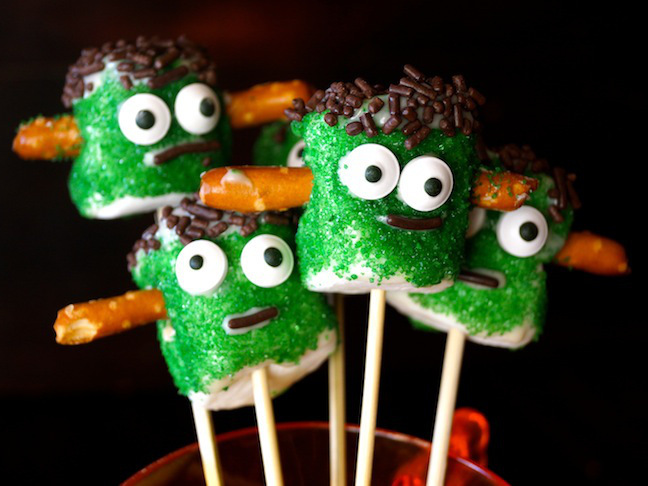 Frankenstein marshmallows make fun and funky Halloween treats! Not only do my kids think they’re hilarious, they also love making them (though I have to admit that my nine-year-old son can barely get the eyes on before he’s eating his). 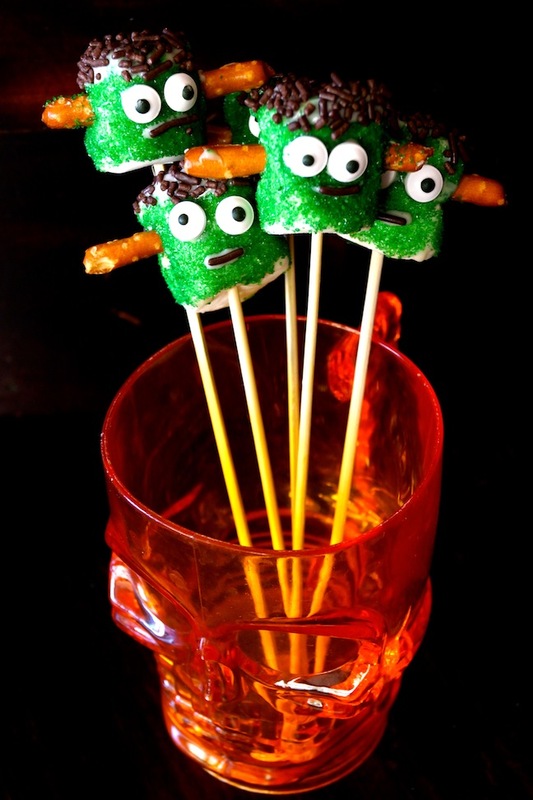 These spooky little guys are quick and easy to create and would be great for a party at home, or would even make a great classroom Halloween activity. 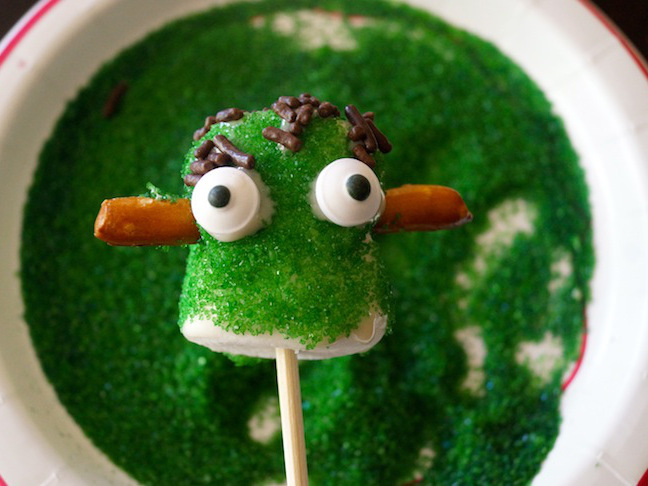 You can provide all sorts of edible decorations so that kids can get super creative. 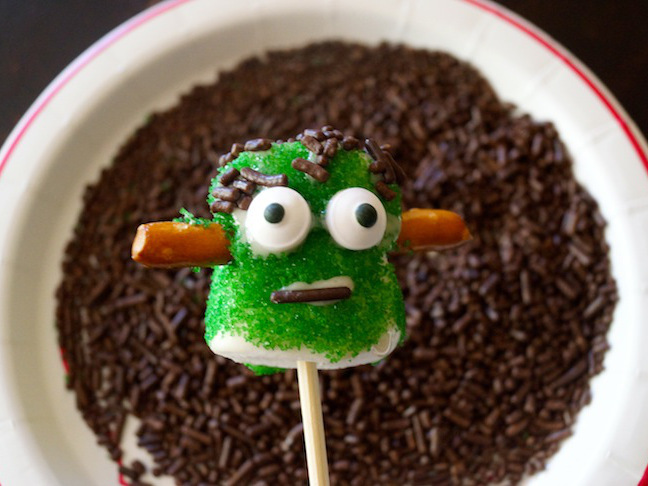 Different colored sprinkles, one eye instead of two, pretzels for funny monster hair through the head…the possibilities are endless. 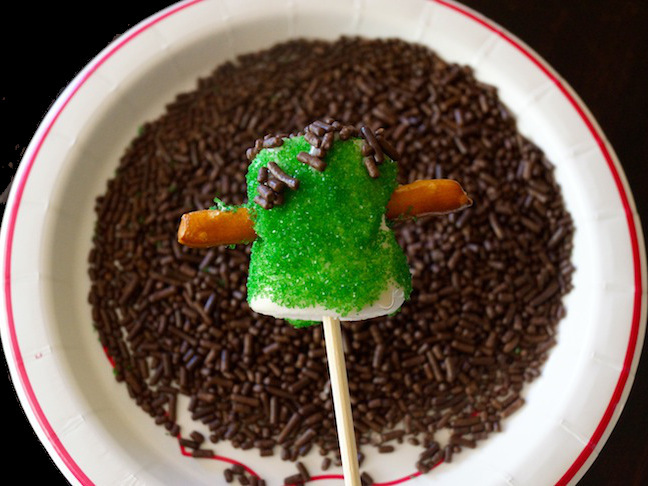 My kids love making these (though I have to admit that my nine-year-old son can barely get the eyes on before he's eating his). Step 1: Add the powdered sugar to a small bowl and mix in the milk, starting with 2 teaspoons. If it's too dry, add the remaining teaspoon—the icing should be thick but spreadable. Set aside. 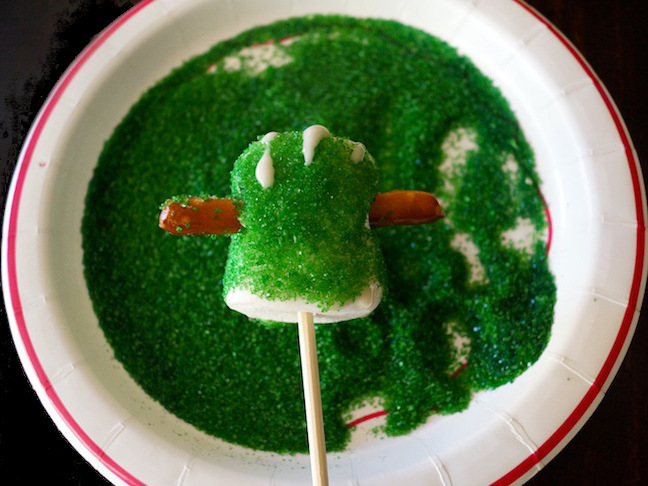 Step 2: Very gently press a pretzel into the top half of each marshmallow, horizontally. Then stick the pointed end of a skewer into the bottom of each one. Press it so it reaches the top but doesn't go through. 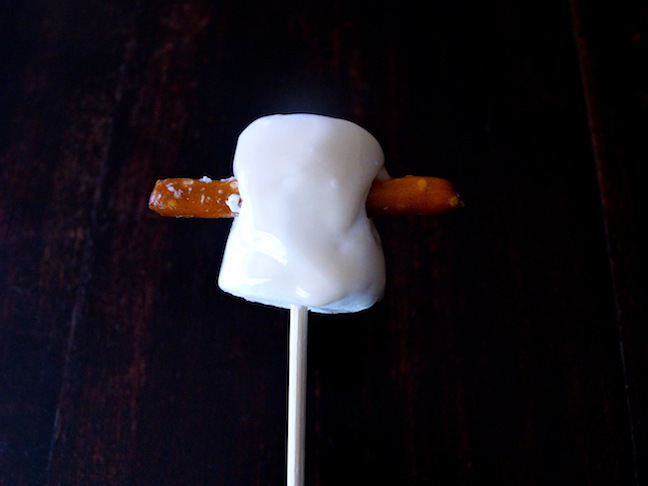 Step 3: Holding the marshmallow by the skewer, use a tiny metal spreading knife to add a thin layer of the icing on the sides and top of the marshmallow, working your way around the pretzel. 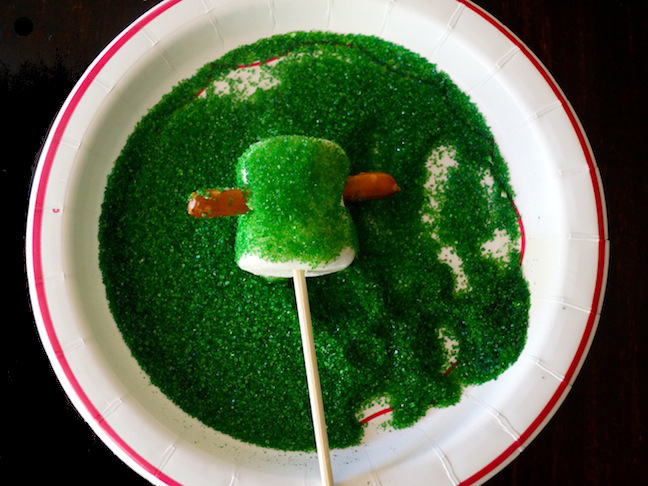 Step 4: Very gently roll the wet marshmallow into the green sugar. 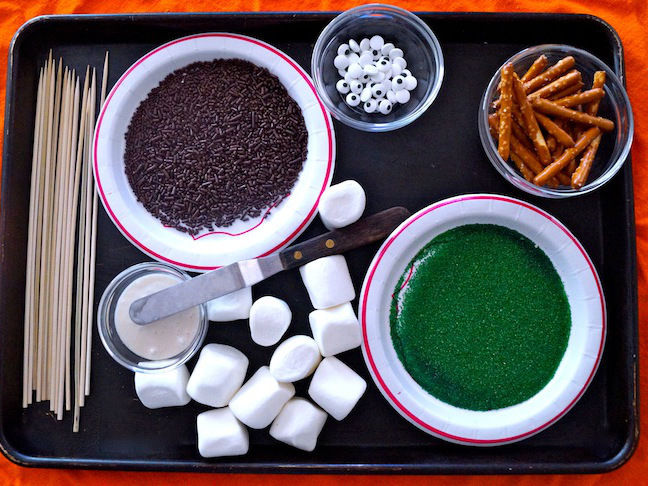 Hold it up with the skewer to coat the sides and around the pretzel, using your fingers to sprinkle it on. Step 5: Add a bit more of the icing to the Frankenstein's "forehead" if you want to have "hair" in that area. Step 6: Then turn it upside down to dip the top and forehead into the chocolate sprinkles to make the hair. Step 7: Add a tiny dollop of the icing where you want the eyes to go. It's easiest to do this with the pointy end of a skewer. Step 8: Now use the pointy end of a skewer to add a very thin line of icing for the the mouth. Add one long, or a couple shorter, sprinkles on top of this line to make the mouth. Step 9: Add all of the finished Frankensteins to a tall cup or glass, and display or serve.